Installing for “I am. And you? Did I mention the space is absolutely amazing? 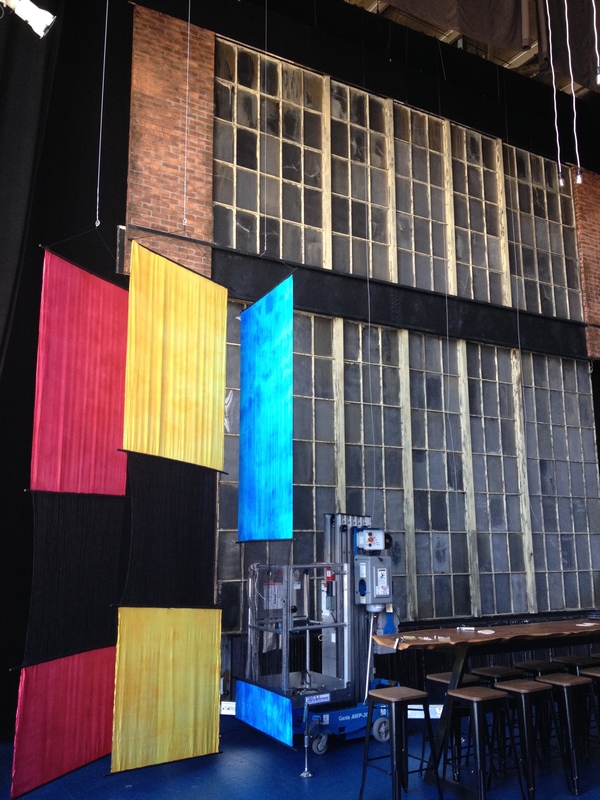 When I saw that piece of set (a huge factory wall which can be back-lit through the windows), the height of the ceilings, the space generally I knew I had to do a piece in that space. So over the last couple days we put up Primary Text and my new work Transparency, created especially for the space and the “I am. And you?” show at Zspace. Primary Text is hung in this image (left), but not yet anchored. I’m excited to see that one in action Participation-wise. Yesterday I finished creating a warp for Transparency (the up and down part of a weaving on the loom) over 15 feet long. It’s right in front of the windows, and the material you will be weaving into it is the colored gels theaters use over lights. You can just see the 3 cables I used to hang it. 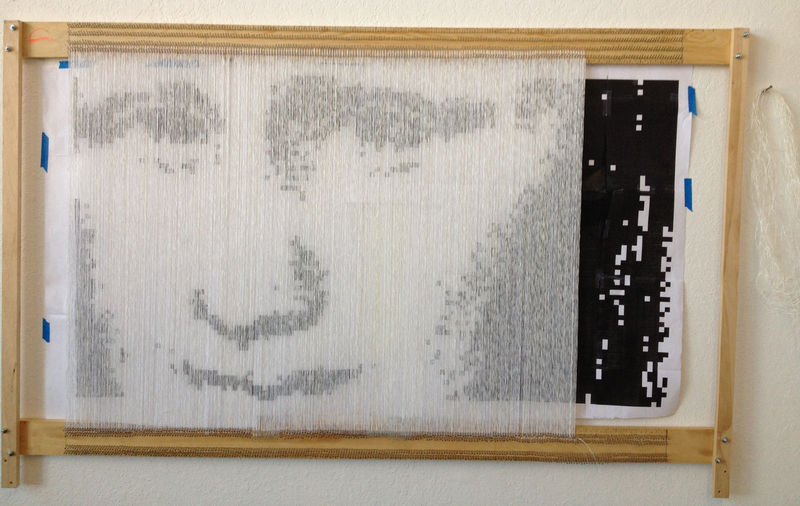 Each person will answer a question and write it on the gels and weave it into the warp. They can also respond to someone else’s answer as if that person asked “and you?”. The physical result should be a kid of stained-glass window lit from behind. I’ve been thinking a lot about ideas and experiences of introversion and extroversion, backstage/onstage/audience, the parts of ourselves we show differently in different company. Filtered selves, not fake, but you don’t let the same parts of yourself through to your coworkers as you do to your lover or your child or vice versa. One odd discovery is how many theatre performers are actually introverts offstage. Given the environment of the theatre and the way lights and windows an that set-piece were working I had to explore transparency and filters while using the visual materials of the theatre-space (sand-bags, lighting gels, a “set” of flat black). I’m excited to see how it all comes out when it’s been interacted with! Please join us Monday night from 6-10 at ZSpace in San Francisco. For those of you who joined me for Open Studios it was wonderful, and an extra thank you to those of you who contributed to the beginning of a new participatory piece. I hope you can all join me for my thesis show! Here is your map to my work! There will be two stories full of incredible art. I will be showing Write Me for Art (for those of you who have been following that piece) and a new iteration of Identity Tapestry. If you are in the Bay Area and have wanted to try that piece out, now is your chance! Write me for Art has become two integrated pieces which I will install together. It came from the many people who sent me replies in the mail to personal questions, all of which I have embroidered and included. There is no sign of the many yards of silk ribbon I hand-dyed for the weft or the last skein of white cotton for the warp. Today was one of those days that all the little things go wrong… until I finally got the materials sorted out and started work. That makes everything better. Warping is so meditative. The first layer of warp (the up and down bit you weave the weft/across bit through) is mostly in place now. New yarn arriving Wednesday to finish that. The optical fiber comes next, then some near-invisible mono-filament for structure. Then some loo/warp setup-stuff, THEN I can start weaving. I don’t think I can really hook up the LEDs to the optical fibers to get them to glow until the whole thing is woven. I was testing the optical fibers again the other night. They are meant to only pass light from one end to the other without you seeing it out the sides. By abrading the surface you get a side-glow. If I abrade any single fiber evenly the whole way the light won’t make it- it will go dark in the middle, so what I’m going to go for is an almost rainfall-like effect- individual fibers abraded differently. The tricky thing here will be that I will have to apply all the abrasion before actually seeing any of it lit or woven, so I will only see a slightly more opaque bit to tell me where the light will be. I have mountains of concept behind this work, but as usual I’m reluctant to talk publicly about it while the work is in-progress. I want to hear people’s experience of the work before telling them what I think is important or what my intentions are. 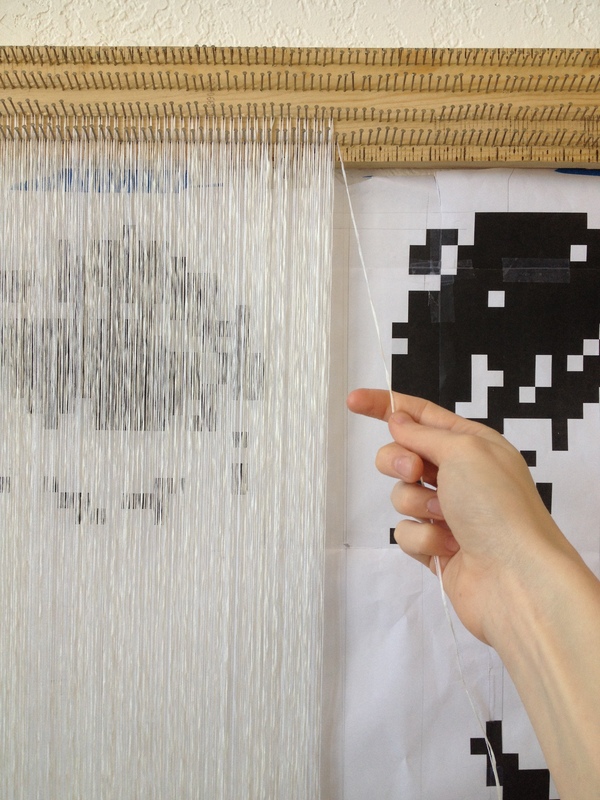 A lot of it in this piece is about the meanings within the materials and their history, and the methods employed to produce the piece- drawing from a painting, digitization, cropping, weaving. The image itself is around the 6th version of same. Days and days of work and artistic decision-making have gone into a deceptively simple derivative image. In other news tomorrow I’ll be meeting with the other artists in the show I organized for the Diego Gallery at SFAI (selected by an outside jury). 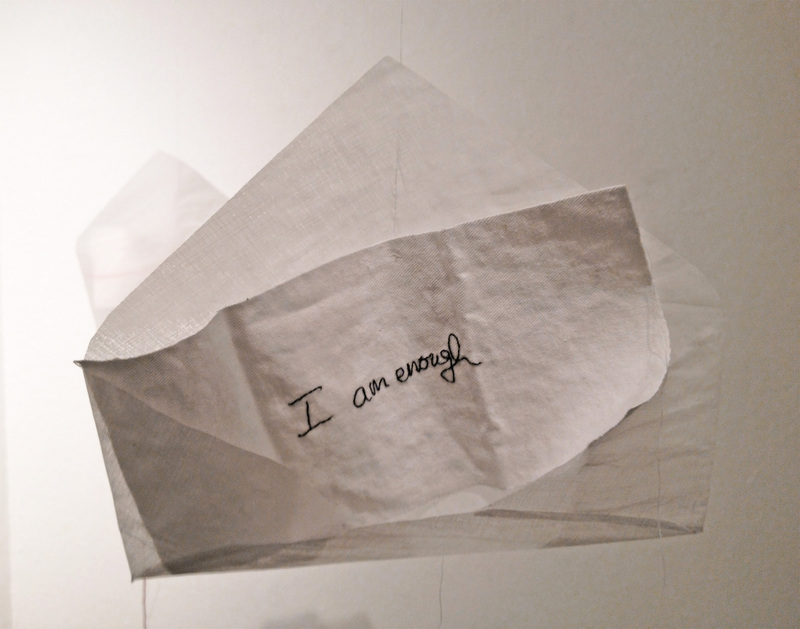 Interwoven Connections– contemporary fiber (April 28th-May 4th). So far so good. Four awesome women (Dara Rosenwasser, Jacqueline Buttice, Heather Jones and myself) working at the intersection of fiber, photography, chemistry and technology. 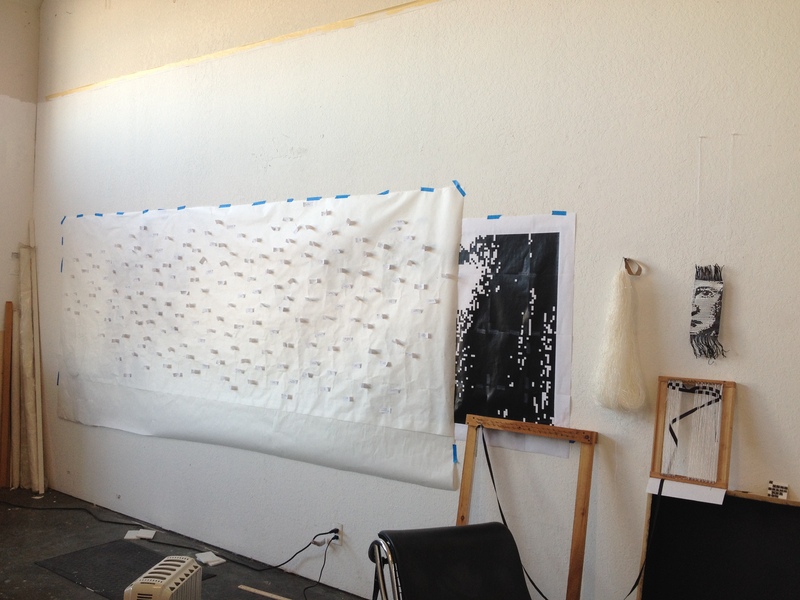 Graduate Open Studios at SFAI is just around the corner. Come see what me and everyone else is working on. Map (you want to take the entrance on 22nd St, not 3rd St.) It’s on the Second floor and includes all bays with orange doors. I am in studio C7. It’s in bay C (one of the nearer bays on the left, studio is in the back right corner). If you come visit you may well find yourself incorporated into an artwork. I usually use Open Studios events for their steady stream of people who can feed into my work, so I am often alternating between hosting my studio and actually working. Also, I can’t stand being in my workspace looking at anything unfinished without working on something! I am pleased to say that I just received notice that I was selected for a Sustainable Arts Foundation Award. They provide grants to artists with families who are struggling to pursue their artistic careers while raising children. So honored to be selected and so glad that there is support out there for artists with families! I have a few projects on the back burner that I was not yet pursuing due to lack of funds. It’s a wonderful feeling to have that obstacle lifted.